View, copy/share, and revoke access to shared reports you've previously created. It can be hard to know which reports you've shared, when you did so, and what they included. But with our real-time list of historically shared reports, there's no longer any need to worry. 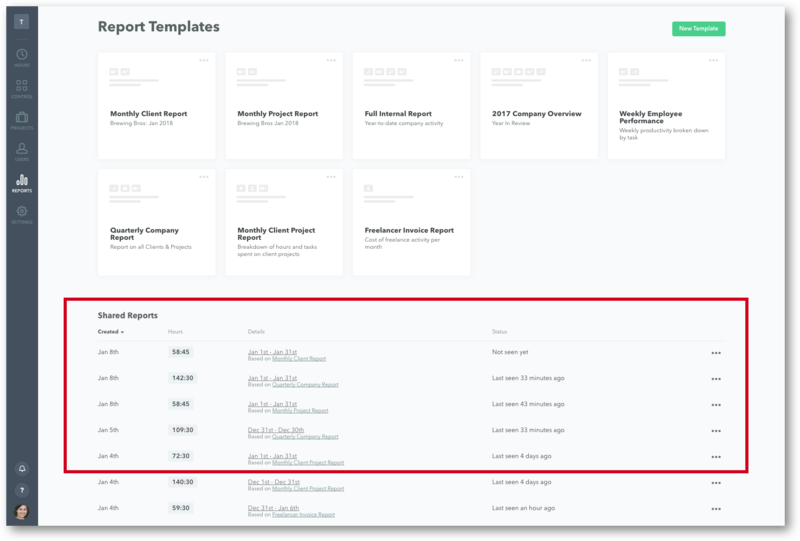 Head to the bottom of your main Report page to see a running list of all your historically shared reports. New templates will appear here once they've been created and shared. How can I quickly get to the shared report I need? It's easy and fast to find the shared report you need by sorting your column filters. You can filter based on the date reports were created, the number of hours they included, the details contained (timeframe covered and report name), and their status (when they were last seen). To view a report that you've created or shared, you'll need a url, similar to: https://public.timelyapp.com/reports/rgMx9FjvWH53hb16XXjHr9EF. All reports have a unique url. Once you have the url, paste it into your browser. This will send you to your publicly-shared report. Can viewers interact with my publicly shared report? If a report is old, the project has concluded or you simply just want to remove access to your shared report, you'll need to "Delete" the shared report. Click on the three dots " . . . "
This will delete the shared report, not your data.